Thinking it would be easier to just get a replacement screen door? Screen door repairs seem like an easy DIYer. But if you have (or want) a decorative french screen door, or an enclosed patio screen room, those seemingly easy repairs just got more complicated. And truthfully, have you ever had a neighbor say to you, "That was such an easy screen door repair! It went exactly like the instruction manual said it would!" You might be thinking it will be easier to just get a replacement screen door. And you might be right. But how do you buy the right screen door now so that you will not end up facing the same dreaded screen door repairs in a few years? Consider these screen door qualities before buying your next replacement screen door. Screen door hardware. Ask if the screen door has a full length piano hinge. Most scren doors have only 2 or 3 small hinges, eventually they begin to break or come loose, the door will start to sag and eventually fall off the hinges. Screen door handles. 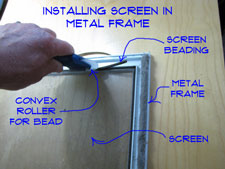 Make sure that the screen door handle and components are made from rust-free materials. Rust is every screen door's worst enemy, and if you live on a coast, you probably know that most screen door handles rust in time and eventually stop working. Trying to find a matching replacement is never an easy feat either! Bug Mesh Screen & Sweeps. Bug sweeps with rubber will dry rot and deteriorate, eventually not sealing properly and letting biting bugs in. Look for a screen door that has an adjustable bug sweep with commercial grade wool pile. When a threshold is not level, rubber cannot adjust because it is solid and will not compress, while wool pile is soft, and the door will swing over the uneven surface smoothly. In that situation a bug sweep with rubber will drag, and cause the door to get stuck, and thus not swing over the uneven surface smoothly. As a homeowner, you probably get frustrated with your contractor every time you have to call them to repair the enlosed patio room or screen door for your house. It might not be their fault though. Unfortunately, a contractor may do good work but if they are forced to use poor quality products, it is out of their control. Don't settle for anything other then the most durable screen door product, it will save you a many headache and annoyance later on. If you are a contractor, you probably get frustrated with every homeowner call back for another screen door repair. Do you want peace of mind that the product you install will last, your customer will be happy, and you can grow your business by good word of mouth when they tell everyone what fine work you do? Or better yet, are you looking for homeowners who value durable and quality products and a credible contractor? Click to learn more about becoming a PCA Preferred Professional.